It’s a simple fact—blood helps save lives. The need for blood is constant. Every two seconds in America, accident victims, cancer patients, children with blood disorders and others require blood transfusions. Bloodmobiles—specially fitted buses containing equipment, beds and supplies—are essential to reaching today’s busy donors. On average, a bloodmobile will travel 1,200 miles per month, collect an average of 3,500 units of blood per year and help raise awareness of the need for blood. These vehicles provide a safe, convenient place for people to donate. 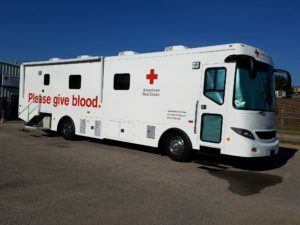 A grant from the Hansen Foundation was used to help purchase and outfit for a Blood Services Bloodmobile to be used throughout Kansas to collect blood and blood products.